Awesome product Does am amazing job Can say enough The videos you see are true!!! tried it on his father inlaws boat THE WHOLE BOAT was covered and It worked ..They surprised him When they brought him to the dock He didnt think it was his boat !!! Prosworks fast and does a beautiful job.. This is powerful stuf. Make sure you use it in a well ventilated area. After spraying it on, the mildew just seemed to disappear. No scrubbing was required. I used it on my boat seats and on the inside of my portable garage cover. Worked great. ProsEasy to use. No scrubbing required. A little goes a long way. I�€™ve tried every mildew product out there with disappointing results. I happened to see this being used from another customer on Facebook so I decided to give it a try, IT WORKS. ConsA easier to pour container would be nice. Finally found a product that works. 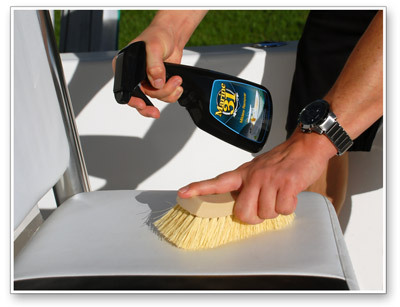 I have been trying to remove the mildew on the top of my vinyl boat seats for years with different products. Marine 31 did the impossible and now I have my white seats back again. Way better than its competitor! The boat shop where I bought my boat gave me a free bottle of Starbrite but it didn't work very well. Went online to look up a better product and watched videos comparing Starbrite and Marine 31so I order the M31 and got the same results as in the video. Do yourself a favor and buy some M31, it really makes a huge difference. 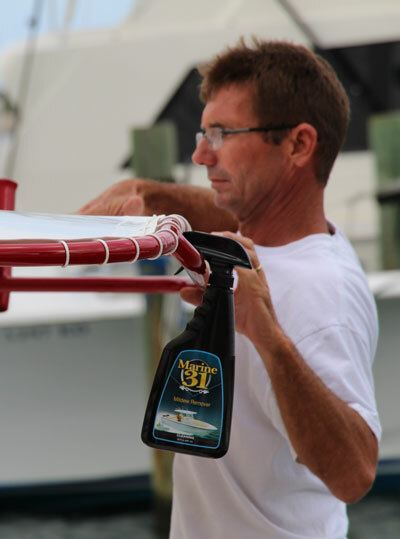 Best cleaner I have ever used on fiberglass boats!